Merge: A push-in classroom delivery of specially designed services. Resource Room: A room for special education and general education students receiving small group pull-out services. Students may spend 30-90 minutes per day in the resource room for specially designed academic instruction. The resource room is not a self-contained classroom. Next month, I will be discussing merging into the self-contained classroom. Last month, I wrote about merging into the classroom. 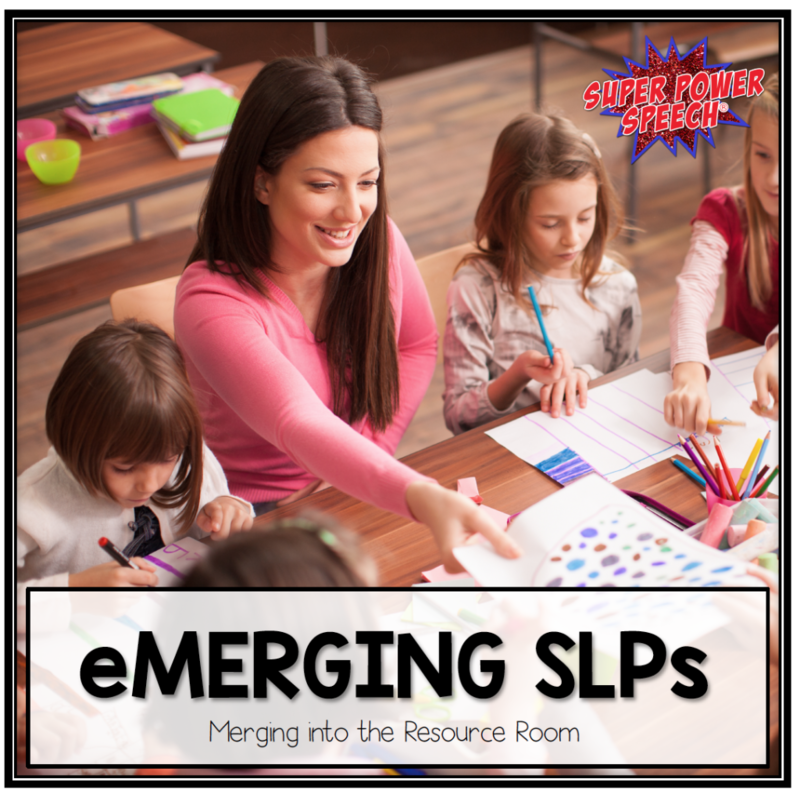 Another question that I hear often from Speech Pathologists is, “How do I successfully merge into the resource room?” Some SLPs try to merge because of parent or administrative pressure to provide services in the “least restrictive environment,” while others are just looking to change their service delivery. In this monthly series of posts, I will be explaining how I have merged into different types of classrooms for the last 5+ years. What makes merging into the resource room work? The special education teacher and I coordinate our schedule at the beginning of the year to co-teach several social skills groups. In previous years, I have also merged into reading groups to provide comprehension and vocabulary instruction. I provide the social skills materials and curriculum, and the special education teacher supports with teaching as well as behavior (these students have multiple behavior needs). We coordinate data for progress reports and IEPs. We are flexible about the groups– some of the students only have speech on their IEP and some only have resource room, but we serve them all together. I began merging into the resource room years ago. The special education teacher and I realized that we had multiple kids with social and behavioral goals but no clear cut direct instruction. We worked together to create “Friday Social Skills” which has now expanded into 4 groups of 3-4 students. In addition, in previous years I have merged into resource room reading groups for 1-2 students with language goals. The special education teacher and myself work well as partners and after the initially scheduling, the process has run smoothly. At the beginning of the year, we created social skill groups according to the needs and ages of the students. Before each session, I put together the materials and bring them to the special education room. Check out my monthly lesson plans to see the social lessons that we teach each week. Data collection is difficult because the groups are busy, fast paced, and full of behavioral surprises. Keeping data with rubrics works well in merge groups. The Speech Bubble has some great social skills rubrics that I’ve used. I also use “Continuing the Conversation Like a Pro” for the warm-up portion of our groups and take data on the number of turns in the conversation. When I have merged into reading groups, I pulled the students for the last 5 minutes of their session and collected data about vocabulary and comprehension from their reading. The students get the benefit of two experts co-treating. Students spend less time out of the general education class because service times have been combined. The special education teacher and SLP learn extraordinary amounts from each other. There is no “i” in “team” and special education and speech work as a team to best deliver services to shared students. Click here to read the rest of the series about how SLPs can successfully merge into other parts of the school. 1. Do you have a resource room in your school? 2. Do you co-treat with your special education teacher in the resource room? Also, since sped/resource generally don’t qualify for Medicaid compensation, it’s probably not an issue, but do you ever run into problems with Medicaid billing when co-treating? I know in my Coop, the OTs, PTs, and SLPs have to carefully note which times they are counting as their services for billing purposes if they do any co-treating. I agree! If you can instruct students about the same vocabulary and stay consistent with each other, then double dosing can be awesome! But you need to careful weigh that with amount of time spent out of class. I don’t need to worry about it regarding Medicaid because my sped teacher does not bill. Very true! We have a handful of kids that are out of the classroom most of the day and it’s always something I’ve gone back and forth about whether to do therapy in the resource room or not. Thanks for the tips!